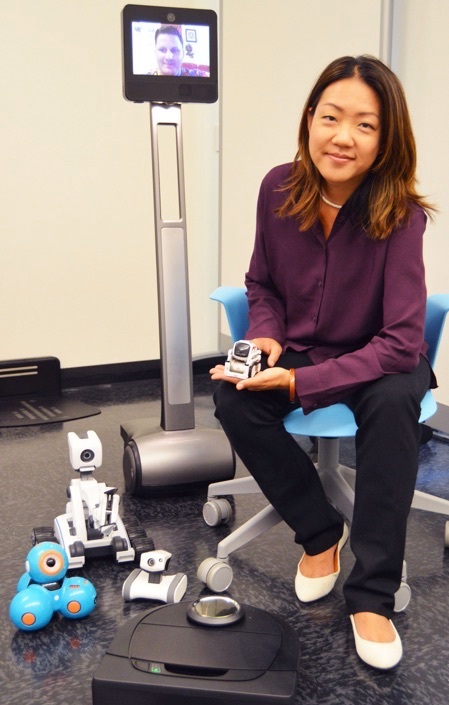 Leila Takayama is an expert on robots, yet she's the first to admit that she has a complicated relationship with these technological marvels. She's happy to have them vacuum and mow the lawn, but she gets nervous in a friend's Tesla when he puts it on auto pilot. Takayama knows better than almost anyone how integrated robots have become in our lives—which also makes her an expert on their shortcomings. Yet her excitement about their potential to enhance human relationships is contagious. Such is the paradox of being a leading researcher in the field of human-robot interaction. "I’m interested in building robots that interact with people, that do things for people in their day-to-day lives, not just in factories and on battlefields," said Takayama, an acting associate professor of psychology who joined the faculty last fall. "People are intimidated by robots, but that goes away when they interact with them. We quickly fall into talking to them like they're alive, like they're our partners, or pets. That's key to my work, which is all about making robots easier to live and work with." Robots have already transformed manufacturing, and they are regular fixtures in hospital operating rooms, search and rescue operations, deep-sea exploration, and bomb disposal. Takayama's work focuses on improving the design and function of personal robots to make them more appealing to humans, expanding what they can do for us. Professional designers and human-computer interaction researchers like Takayama are making robots more approachable. "We’ve learned from the lessons of developing personal computers, that we can make these seemingly complicated systems more user-friendly," she said. Takayama specializes in robots with "telepresence"—machines outfitted with video and telecommunications gear that are fully or partially controlled by people. They range from the size of a toy poodle to an adult human, but Takayama's favorite model is about four feet tall and looks a bit like an iPad on a rolling vertical stand; it retails for about $1,500. Operated remotely by a human, these robots allow operators to "beam in" and connect with people remotely. In the workplace, these robots are a vast improvement over teleconferencing, because they literally enable colleagues to "take a place at the table" during meetings. Afterwards, remote colleagues can roll down the hall and remain part of the conversation, or linger to be part of the post-meeting debrief. "In an ideal world, you forget there's a robot there," she said. "I want them to disappear the same way telephones have disappeared. When I’m talking with my grandma on the phone, I’m just talking with my grandma. I’m not thinking about the complex devices and networks that are enabling us to have that long-distance conversation." Takayama's current research involves interviewing people who use robots to learn what they like, what they don't like—and what they really hate. Those shortcomings are what get robots "hijacked," or shut off. In hospitals, robots may do a good job of delivering towels and charts, but if they can't get out of the way of nurses as they hustle down hallways, the nurses will pull the plug. "My goal is to make robots fade into the background of our everyday experiences," said Takayama. "I want them to become so quietly useful that they become unremarkable." 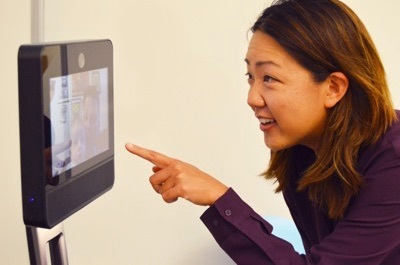 Takayama is excited about bringing robots into assisted living facilities to enable distant family members to virtually "visit" elderly relatives. Surveying older adults who pilot-tested the technology, she was struck by how readily they embraced it—and by how strongly they want to be able to control the timing and frequency of visits. "They don't want their kids just showing up unannounced!" she said. They also want to be able to visit with friends—and to reverse roles, "driving" the robots so they can "get out" to museums, ballparks, concerts, and other places they can no longer get to on their own. "Like most other technology, robots need to bring value to our lives," said Takayama. "I'm not going to charge my phone every night, if it doesn't provide value to me the next day. Robots need to be useful." They also need better social skills—basic things like not "standing" right smack in the middle of an elevator. "I mean, come on, that's just annoying!" she said. "At Stanford Hospital, they've had to post signs that basically say 'If there's a robot in this elevator, don't get on.' We've got to be able to do better than that!" Takayama studied psychology and cognitive science as an undergrad at UC Berkeley, and she earned a Ph.D. in communication from Stanford. She spent eight years in industry before joining UC Santa Cruz, working in open-source robotics for four years and then joining Google X, the company's super-secret "moonshot factory," where she worked on the then-secret drone-delivery project. "Research is what I love," she said, but her work is highly interdisciplinary, encompassing psychology, computer engineering, and linguistics, so Takayama found the secrecy confining. "I need my research to be out in the open." At the moment, robots remain mired in a public relations quagmire, and not only because they do a poor job of sharing the elevator. The fear persists that robots will displace workers, and science fiction tales of robots taking over the world feed into the narrative that robots have minds of their own.